Some sleuthing of my own quickly unearthed certain outrages among fans and aficionados of English crimester Agatha Christie: her 1934 book of the same name was indeed about convalescing aristocrats, exotic snakes and Chinoiserie but Miss Marple, one of her serial detectives, was absent! The makers of this 2009 telemovie chose to insert her into the crime-solving. Being ignorant of her books (never having read a single one), I would have been happy without knowing this. Yet even while I was watching, I couldn’t help but notice that the duo of two youngsters, a boy and a girl, were doing quite well at working it all out. Miss Marple (Julia McKenzie) floats around knitting, visibly superfluous. I initially thought that was part of her genius—solving passively—but it was actually a symptom of the decision to insert the character. My hunch is that the whole dirty scheme was a marketing manoeuvre. Her name and image are all over the cover. But moving on from this insanely minute tirade, I have to say it was quite watchable. You keep wanting to know what happens next in this big old house full of eccentrics: the creepy, deficient siblings, for example. In fact, it was so good to see Hannah Murray again (she played Cassie in Skins), especially as a posh freak. I have to say though, the whole affair is a bit twee. 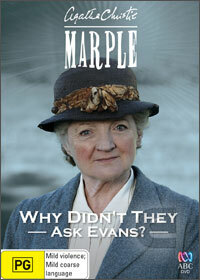 You have to be a fan of the BBC look, England and English actors to get much out of Why Didn’t They Ask Evans? I wouldn’t recommending spending money on something you’re vaguely curious about because it’s no mystery: you’ll be disappointed. My friend says hunt down adaptations that are more faithful to the books. But a Christie fan would say that, eh?